David Barca, vice president of Pacific Union’s Silicon Valley region, authored the following article, which originally appeared in the Palo Alto Weekly on Dec. 26. Our local real estate markets have seen a significant uptick in sales activity at the highest end of the spectrum thus far in 2014. According to MLS data, there were 17 $10 million-plus single-family home sales in the communities of Atherton, Palo Alto, and Woodside between Jan. 1 and Nov. 30, a 70 percent increase from that same period in 2013. This year’s 10 most expensive home sales in the aforementioned communities that were listed on the MLS through Nov. 30 ranged from $27.4 million to $13.5 million — six in Atherton, and two each in Palo Alto and Woodside. The properties run the gamut in terms of size, from a 13,558-square-foot mansion in West Atherton to a relatively modest 5,240-square-foot home in the coveted Old Palo Alto neighborhood. Seven of these homes sold in the second quarter, underscoring that real estate activity heats up in the spring and early summer when sellers are likely to encounter many buyers hoping to land a home before schools close for the summer. At that time of year, even the priciest properties can attract motivated, fast-acting buyers. For example, two Atherton homes that sold in late June – one for $14 million and one for $13.5 million – were gone in just four days. Newer homes are increasingly popular in the Bay Area, particularly given the influx of buyers from Asia that tend to prefer more recently built properties. Six of this year’s 10 most expensive homes were constructed since the turn of the most recent century, including No. 1 and No. 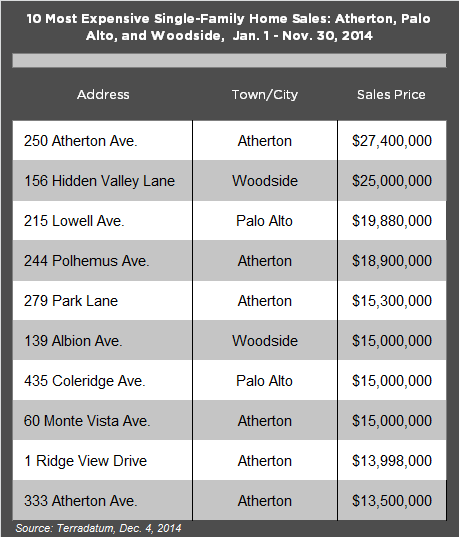 2: $27.4 million in Atherton and $25 million in Woodside, respectively. That’s not to say that a home with a little more history won’t appeal to buyers, especially in superheated markets like Palo Alto. The aforementioned Old Palo Alto home, built in 1925, sold for about 2 percent more than original price, the only one of the 10 priciest properties to command a premium. Paying top dollar per square foot holds especially true at the highest end of our real estate market. The average price per square foot paid for these 10 homes was $1,935, compared with $1,100 for all properties sold in the three communities from January through November. A three-bedroom home in Woodside that sold in September offers a drastic example of what some affluent, motivated buyers are willing to pay: At just less than 6,000 square feet, the home sold for its $25 million list price, which translates to a staggering $4,170 per square foot. Our local real estate markets have recently involved frenzied competition, in which multiple bidders drive the final sales price far beyond the original. In one July instance, a brand-new home in Downtown Palo Alto sold for more than double its original price. Six of the 10 most expensive homes appear to have been accurately priced, with half of them selling for their exact asking prices, and one fetching a modest premium. The other four homes may not have been priced correctly, allowing buyers a bit of wiggle room to write lower offers. One such home in West Atherton, initially priced at $16.9 million, sat on the market for almost a year before selling for $15 million, 88.5 percent of its original price. This highlights the fact a property must be priced accurately in order to sell quickly, even in markets where willing buyers far outnumber the inventory of available homes. Next PostNext Happy New Year From Pacific Union!